Cathy's Cuppa: My first creditable Latte ... well, my first ever Latte, really. My first creditable Latte ... well, my first ever Latte, really. Made my first latte this last April. Granted, the coffee concentrate produced by the AeroPress, isn't technically espresso, but it's the best I can do at home (for now). I frothed the milk with the Bodum - I picked it, because the carafe is glass, and I can warm the milk in the microwave. 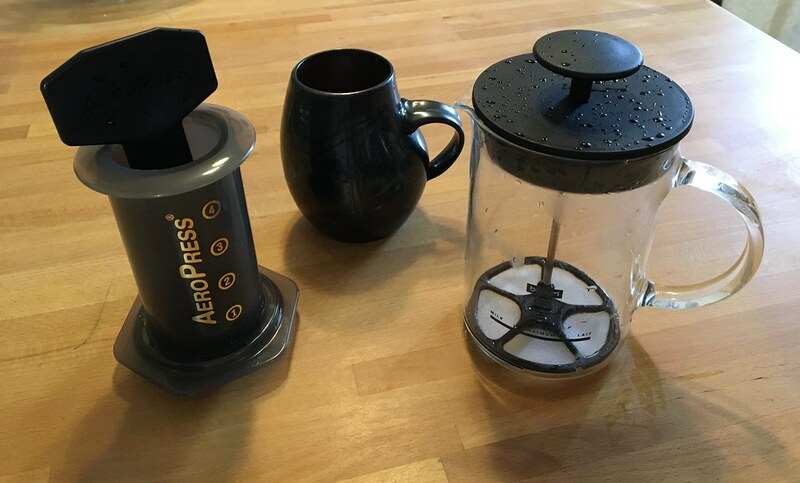 The lid/frothing apparatus is plastic, so I don't warm the milk very much (not that it matters that much, I suppose - the AeroPress is all plastic, and the water I use for that is MUCH hotter). But I was quite satisfied with my latte. And my daughter occasionally asks for lattes now, so these tools will get regular (if infrequent) use.